Reserator XT meets GT1000. Zalman’s first gaming case with built-in water cooling. 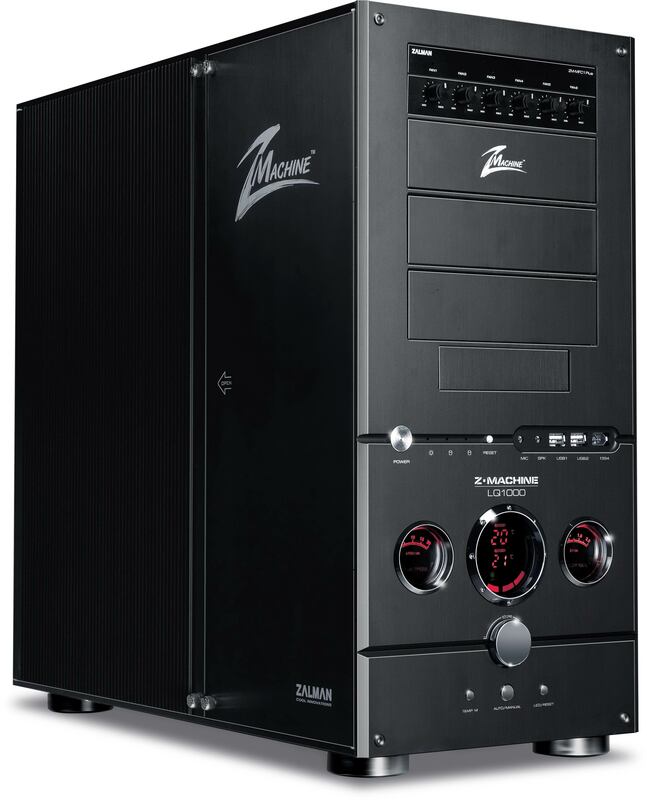 All LQ1000 systems sold by Quiet PC since 8th April 2009 have been supplied with Zalman's new ZM-WB5 Plus CPU waterblock (as well as the original ZM-WB5), which means they are Intel LGA1366 (Core i7) compatible. 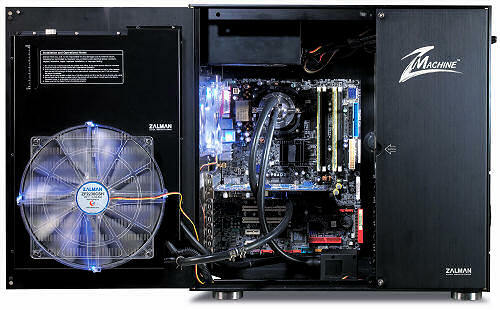 Zalman's elegant LQ1000 is an amalgamation of the Z-Machine GT1000 chassis and the Reserator XT. 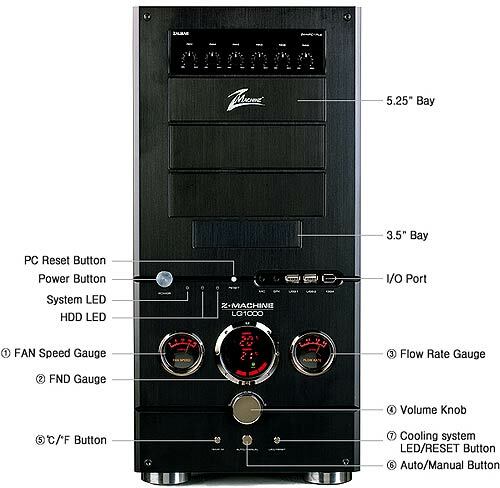 The case incorporates everything a total watercooling solution requires. Pump, tubing, radiator, coolant, reservoir and ZM-WB5+ CPU water block are all supplied, in fact all you need to complete the build is water and a few components of course! The ZM-WB5 Plus is Zalman's latest and best-yet CPU water block. It incorporates a pure copper base for excellent heat transfer, and the cover has been anodised to prevent corrosion. The ZM-WB5 Plus supports Intel Socket 1366 and 775 and AMD Socket 754/939/940/AM2/AM2+/AM3 CPUs, and is designed to be lightweight and easy to install. The anti-corrosion coolant supplied with the LQ1000 has been designed to prevent corrosion not only to the LQ1000 but also other materials it comes into contact with, such as copper, aluminium and plastic. This provides peace of mind for long-term operation. It is to be used in conjunction with distilled water only! The coolant provided with the LQ1000 is the ZM-G300. This is exactly the same as the ZM-G200 except the bottle contains only half the amount, because the LQ1000 has a smaller radiator capacity. This gauge displays the internal temperature, water temperature, water level, and mode. The black background and wine colour details intensify the LQ1000's striking aesthetics. At either side of the temperature gauge is an analogue display. The left display shows fan speed while the right displays coolant flow rate. These buttons allow the user to switch between automatic or manual control. This provides the greatest flexibility. There is also a power LED and reset button. Zalman have made available a range of waterblocks for a multitude of graphics cards. The blocks cleverly cool not only the main GPU but also the other components around the graphics card, such as the memory, FET and I/O chipset. The blocks are low profile and so won't obstruct adjacent slots. This anodised aluminium Northbridge water block is an ideal replacement for a Northbridge cooler that has a small noisy fan installed. The block attaches to the motherboard by using push-pin holes or hooks.